The last couple of days were a whirlwind. I'm grateful for all the feedback received, and humbled to see how many of you are enjoying the app. There's a few other very small quality of life improvements as well (e.g. timeline labels changed to make loop duration less confusing etc. ), all fairly subtle, but hopefully they'll have a positive impact on your workflow. @blueveek keep doing what you’re doing! I’m loving this app! Thanks for all that you do @blueveek!! I just installed the update and I see a submenu with the ... characters. When I select it, more options appear (time signature, brush selectors), but then there’s no way to go back to the first options displayed. Is this by design? How do we go back? Use the tool, or tap anywhere else. Confirmed. Thanks and congrats on an excellent app. One last quick note...I still need to flip my phone into Portrait view in order to see the octave arrows. There are no submenus on the right hand side. From my testing, cramming absolutely everything together into such a small space isn't going to be pleasant to use. Everything else is accessible from the expando menus. Good deal - Just wanted to confirm. The easy editing tool access was the main fix I was looking for. ...after pressing the 3 dots to access the tools there's no way to 'go back'. Looking good so I tap on the 3 dots to access the tools. But how the 'insert favourite wtf acronym here' do I get back to the 'pre 3 dots' mode so I can access record and the other 'stuff' I could see before I tapped on the 3 dots?! (I've not found a good solution for this yet). One solution could be to 'toggle' between record & edit tools and tempo/transport & undo/layer/grid. (Usually when there's a button to 'open' a menu the same button is also used to 'close' it). Yeah, the reason it is how it is is that sometimes there’s no space even for that open/close button. Take a look at the top toolbar in portrait mode for example. Space really is at a premium on those small devices. I’m sure there’s a probably better solution to all of this than the one I’ve managed to come with I think the “proper solution” will become obvious in time, once workflows settle in and people use it more. The tap on the grid can add un-intended events when closing the menu so maybe a tap on the 'piano' could optionally close it as well? (But that could in turn cause issues if record is enabled since the piano can be used in record & step-record modes). I just wanted to say that your approach to customer interaction is an inspiration. You strike a great balance between being informed by customer feedback but never allowing it to lead to feature creep and loss of focus from your original design intent. If only all iOS developers could be the same! 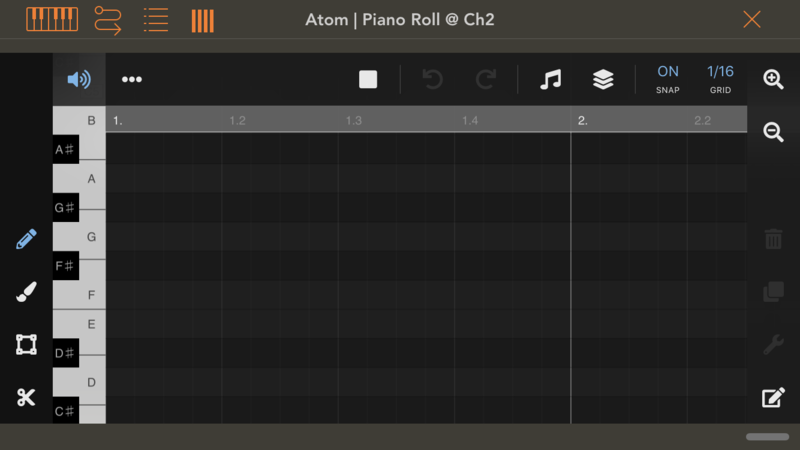 I use ATOM step-recording in AUM without any problems have you chosen any 'input' for Atom? (I've fed it with external 'keyboard apps' as well as hardware controllers). This is an AB3 specific thing for now, with third party keyboards. Looking into it. 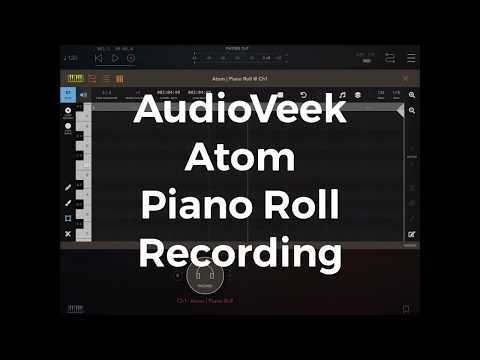 It doesn’t work with AUv3 midi keyboard apps. All the notes stack on the first beat. Maybe you were using an IAA / Standalone version? oops. Only doesn’t work in AudioBus. It’s OK in AUM. 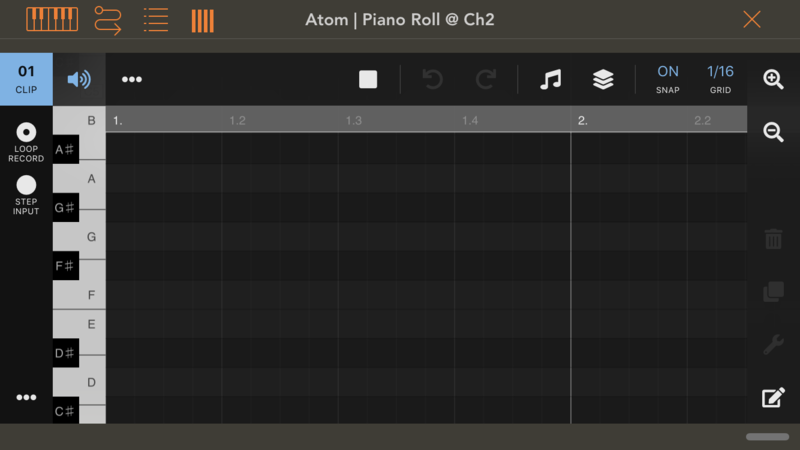 (In both Cubasis and BM3 I wish I could 'replace' the built-in editors with ATOM hehe). Just got this app, and the update. Seems fantastic so far. 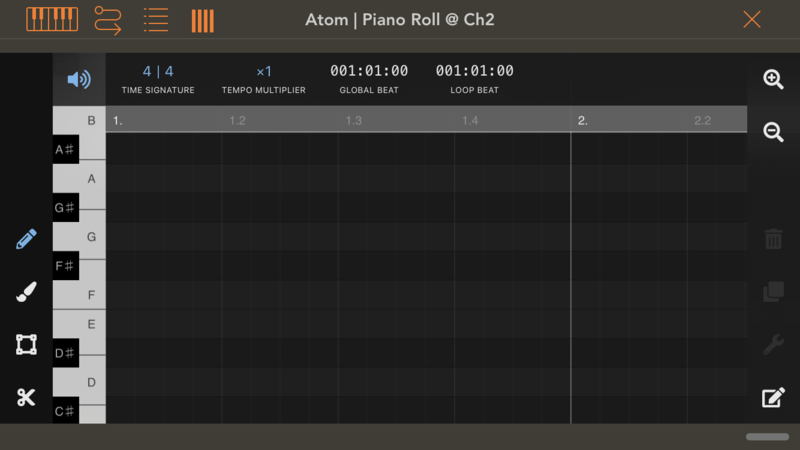 Just wondering if I'm missing something - is there a song mode, or perhaps a way to change sequences via program change? Interested to know if there's a way to arrange longer compositions in Aum rather than loops. Sorry I thought this was the Audiobus forum - not the AUM forum. 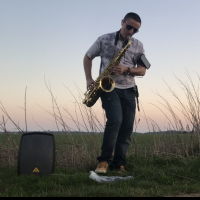 I see no problems with step recording in AudioBus. It draws the note and continues to the next part of the grid. @blueveek, thanks for your hard work. Audiobus doesn't support AU3 Midi plugins though, does it?